I will admit that I really enjoy karaoke. I also really enjoy watching self-absorbed teenagers get picked off one by one in a good slasher movie. It never occurred to me, however, that you could combine the two. Luckily, it did occur to John Paolillo, the creator and director of "A Murder Mystery Karaoke Show," currently playing every Thursday night in October at the Stonewall Inn's upstairs stage. The result is less Miss Marple and more Scooby Doo. Less slasher and more Thriller (Paolillo is a choreographer, after all, so moves get busted). Less Freddy Krueger and more Rocky Horror. Less Cabin in the Woods and more Miss Scarlet in the library with a lead pipe. "Murder Mystery" uses familiar tropes - an unexpected invitation, a night to be spent in a creepy house on Asylum Island, a prize to whomever can spend the night, a mysterious benefactor, and of course, lots of murders. The characters are, unsurprisingly, a cross-section of every teen movie ever - jock (Trevor Livingston), cheerleader (Andrea Levinsky), gay boy (Danni Vitorino), goth chick (Rachel Hering), overenthusiastic nerds (Kristen D.J. Robinson and Molly Heller), and the black guy (Gavin Juckette) that everyone expects to be killed next (the fact that this particular black guy is white and somehow keeps surviving is a running joke throughout the show). The hows and whys of the murders, the unmasking of the killer (who no doubt would have gotten away with it too, if it weren't for those meddling kids…), the surprise twist ending, the other surprise twist ending… well, really it's all just window dressing. The show is meant to be lighthearted, silly fun. It's a chance to go out with some friends, grab some drinks, and sing along (loudly, and in different keys) with some great karaoke music, all while watching good-looking teens get gruesomely murdered. Is there a better way to spend a Thursday night? I don't think so. So a few things to know. As an audience member, you are a ghost on or around Asylum Island. You will have things that you are supposed to say (and sing). If you sit close to the stage, chances are good that you will be a featured singer (the night I saw it, two of the folks in the first row were called onstage to sing - both of them reveled in their spotlight moments, with surprising and delightful results). Even if you don't sit near the stage, chances are you will have a microphone put in front of your face at some point. But don't worry if you don't sing well, at least you won't end up dead like the rest of the cast. And speaking of the cast, they are a lot of fun and each actor gets a moment to shine (either in song, or in a really fun death scene - often both - or creatively trying to get a microphone back from an audience member). Standout moments include Levinsky's death scene, sung to probably the most ironic of the night's karaoke numbers, Hering's offstage death scene and the bits of her that make it back onstage, and a great costume reveal (which I won't spoil) by Vitorino at the climax of the play. So if you like karaoke, murder and drinking, you may have found the show you didn't even know you've been waiting for. 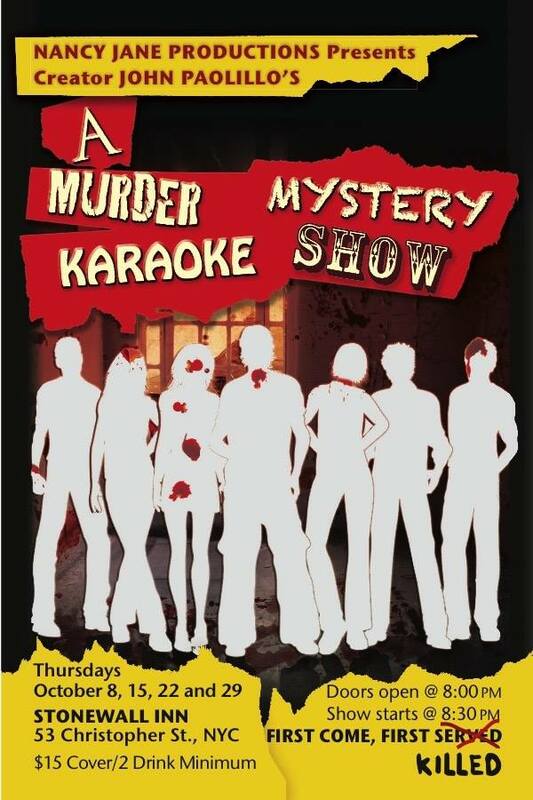 "A Murder Mystery Karaoke Show"
Featuring: Trevor Livingston, Andrea Levinsky, Danni Vitorino, Rachel Hering, Kristen D.J. Robinson, Molly Heller and Gavin Juckette. "The Christians" - Whose faith is it anyway?